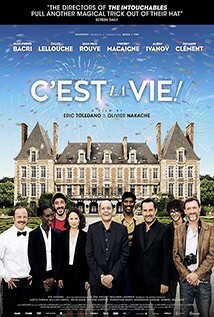 A classically constructed ensemble comedy in the tradition of the greats from Eric Tolendo and Olivier Nackache, the new kings of French comedy who previously created ‘Intouchables’. This very funny film successfully closed this year’s Chichester Film Festival, coming second in the Audience Award, is like a good wedding champagne - bubbly, frothy fun with an excellent structure and a hint of complexity that leaves you on a high. Not that wedding planner Max (Jean-Pierre Bacri) has any time to stop and have a glass, he's far too busy trying to ensure that the only hitch on a big day is between the bride and groom. Set over the course of one event, the directing duo prove adept at planning and crowd management, plunging us into the workings of the backstage staff and some of the wedding party without losing us in the melee.